There's some great biking east of San Diego, in the Alpine and Laguna Mountains. 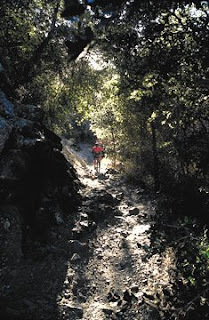 Noble Canyon is an IMBA Epic and the Big Laguna Trail is another favorite. The San Diego Mountain Biking Association is teaming up with IMBA to open up 10 miles of singletrack that were previously closed to mountain bikes! Last weekend members of these groups practiced state of the art trailbuilding techniques in the Chico Ravine/Big Laguna Trail System at Mt. Laguna. Information about the event is here. Soon, thanks to volunteers, there will be world class biking options just outside of San Diego. Photo from IMBA website here.